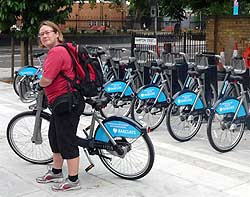 We were there at our local docking station by the Elephant and Castle at 6am this morning at the very moment the London Bike Hire Scheme launched. It's mostly good news. The member-key system works fine. 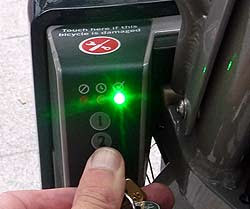 Taking a bike out is easy and quick: you don't have to log in, you just stick your key into a slot, release your bike and cycle away. Redocking it automatically checks it in: you don't have to log out or do anything. The bikes are fine: a bit low-geared perhaps, and the front-heavy handlebars can feel like you're pushing a wheelbarrow full of cats; but they're comfy, straightforward, and hop-on-hop-off easy to ride. There's no lock: so what? Use the next docking station. And no helmet: quite right too. For £1, about the third of a cost of a muffin or coffee on station concourse, you can ride the bikes for any number of half-hours in a day free. 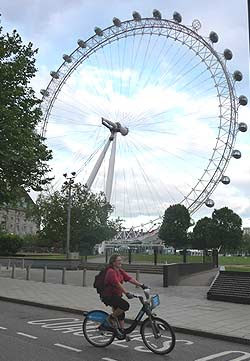 We breezed around in delight between various docking stations on the south bank this morning between 6am and 7am. We only spotted two other pioneers riding hire bikes in that time, one of whom was the editor of a certain local news website. We spotted several snappers and film crews, though, some of whom spotted us before we could escape, so you may see us on TV tonight. Over 11,000 people have signed up for membership keys, though only 4,000 have activated them. And there are about 4,700 bikes currently available at the docking stations, of which there are 284, 330, or 360, depending on whether you believe the Evening Standard, TfL yesterday, or TfL on Tuesday. Some people will complain that the hire bikes will mean untrained people with no idea about British road rules careering dangerously about the streets. People such as TfL-licensed minicab drivers, for instance, who no doubt think that's their prerogative. Well, tough. Share the road and play nicely. It's ours too, you know. 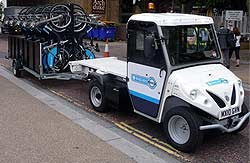 Bikes that need to be redistributed from full docking stations to empty ones are conveyed by trailer pulled by electric cars like this one. The problem with this is that if you take a bike out, find it's stiff and then re-dock it, you have to wait five minutes until you can take another one out. So pioneers are advised to check the back wheel spins OK before putting your key in to take the bike out. Otherwise you'll have five minutes to fill, and presumably in London docking stations are like bus stops and you're not allowed to talk to anyone. And, inevitably, some tedious whinger had put stickers on some bikes complaining about Barclays sponsoring earthquakes in the third world or something, which involved extra work for some TfL people this morning going round unsticking them. Working out where the live docking stations are isn't yet totally reliable either. We couldn't find out from the docking station terminals we were at this morning because they didn't appear fully operational, though the SE1 website's report on the launch at the Belvedere Rd station, Boris Johnson and all, evidently had no problems. There's the printed TfL map - but it was compiled a while ago and it shows some docking stations that haven't been built (such as the one on Lambeth Bridge). And the online TfL map shows the updated locations of docking stations, but some of them haven't actually gone live yet (such as the one on Albert Embankment, just down from Lambeth Bridge, which was covered with tape and not yet in service this morning). But these will be fixed. For the meanwhile we're delighted to see the scheme up and running. We think this has added a fun and creative new dimension to London's bike culture and we're all for it. There's more of this to come. Update 8.50am: According to Dave Hill's blog, 12,000 people have now signed up as members, 6,000 membership keys have been activated, and 5,000 of the bikes are available at 315 working docking stations. It sounds great. I think quite a few more keys would have been activated had they actually arrived - I and several friends would have been trialling the bikes today if we'd had the keys. I think it's pretty trite and socially irresponsible to ignore major sponsors who do so much to harm people. But that's not about cycling is it? That aside, Pioneers or cash cow slaves? Why dance to others tunes when you can get a second hand or reconditioned bike for a couple of years membership and not run the risk of extra charges, perhaps a £300 fine for losing it or worse still, a fault on the system which says you lost a bike? Real Cycling should be about freedom. A rideable second-hand bike for £90, @Anonymous II? Not in London! If spending a quid for unlimited half-hours is being a cash cow slave, then moo. What is 'trite and irresponsible' is plastering things with stickers to promote your own political views. So I suppose I shouldn't ever watch premiership football either? Don't these self-important troublemakers realise that their petty whingeing is counter-productive? If you have a problem, fine - lobby your MP or write to your local paper or deal with the target company direct. Don't litter my world with your pompous attention-seeking. As it happens, I sympathise with their viewpoint. They've just gone about foisting it on other people in a childish way. An excellent summary of the hire launch Rob, sounds like you had a lot of fun being the first to ride some of these bikes. Of course we all have concerns about the corporatisation of public space, but seriously, if you want to do anything slightly 'out there' in the country (Build an Olympic stadium, design a bike hire scheme) of course you have to have some corporate backing so as not to be seen to be too much of a burden on the public purse. If the money helps the scheme work then so be it - do these people object because the tax revenue from these companies is also used to build hospitals etc? 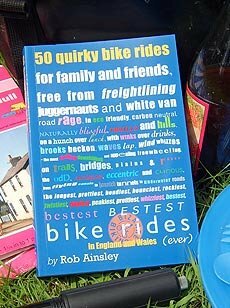 And as for buying everyone a bike instead... for £90?! Pffft... Besides, its not supposed to be like owning a bike ( everyone can do that) this is a new transport scheme, like a new bus route, and you don't take the bus home with you at the end of the route do you? Surely the best way to avoid being trite and irresponsible is to do precisely what you say we shouldn't do, which is to 'ignore the sponsors' by not banking with Barclays. Sticking something on these bike is rather pathetic as the very people who are likely to hire one are either foreign or already socially conscious to have considered this viewpoint already. Anyway I hope to try out one of these machines in due course and look forward to further insight. Has it become clearer how things work for members who have chosen not to "auto-renew" their access? Does it reject your key? As for Barclays, having a piece of plastc bearing their logo attached to my keyring does feel a bit odd for those of us old enough to remember the days when dealing with Barclays was totally taboo for anyone who opposed Apartheid. I own a bike and use it to commute regularly. Borisbikes are going to be my transport supplement for days when I chose to use public transport (eg I'm going for a drink after work and don't want to cycle 9 miles home afterwards) this is because I know it takes 10 minutes to cycle to my office from Waterloo but public transport can take over 30 minutes, it’s cheaper too because being a cycle commuter, I don’t have a season ticket. "The problem with this is that if you take a bike out, find it's stiff and then re-dock it, you have to wait five minutes until you can take another one out." This is not correct... did you actually try this? I thought the stickers were done in a classy way. They didn't spoil the aesthetics of the bike and that's what is most important :p I can the people complaining about those beatiful stickers the "tedious and whingeing ones". I don't think it was a tedious whinger who stuck that sticker there. As a cyclist we probably feel that we are doing good for our town or the environment by cycling not driving, so why is someone who is raising awareness of the terrible things Barclays does outside of London now being called a tedious whinger? Hi Rob, regular reader, first time commenter. I hope dismissing the stickerer as a 'tedious whinger' was thoughtless rather than your considered opinion. Drawing attention to the fact that anyone banking at Barclays is indirectly investing in arms is a highly socially responsible thing to do. Here's a picture of the stickers for anyone who's interested. I think they carried a useful message and were even done rather tastefully. Picked up a bike from near Imperial War Museum, Rob is right when he says some are a bit stiff, I thought maybe it was me and it would get easier as I rode along. 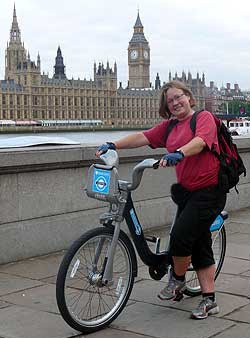 It was terrible, I thought I would have to get off and push across Waterloo Bridge it was that bad. This is a ride I do every day without any trouble. I realise its a teething issue but surely anybody wheeling the bikes into the docking stations last night would have noticed? I will try again tonight and check the action of the wheels first. I note from the docking station map that there's the usual north-London bias - no docking stations south of Vauxhall, but plenty of them in outlandish suburbs on the far side of Euston Road. That's a bit inconvenient for those of us who regard Charing Cross as the centre of London rather than, as TfL seems to imply on its map, Holborn. Why are there docking stations in Camden Town and not, say, Brixton or Clapham Common? So next time I'm in the West End, I won't use a Borisbike to get home since I'd have to dump it at Vauxhall and get a bus, costing an extra £1.20. Disgusted by the attitude of this blogger. It is one thing our Government allowing at our behest our cities and towns turned into a giant experiment in capitalist propaganda, marketing, advertising and visual brainwashing - in the name of corporate sponsorship. Quite another when some gutless wimp stands us for them; as Barclays or any other sponsor should be treated with anything other than derision and animosity. So congratulations to the brave freedom fighters sticking these messages onto what is meant to be a public service - that we are all paying for. Its one thing that these bikes aren't free considering all the money taxed from cars, congestion charges etc. Quite another that we are using insidious corporate sponsorship as well. "tedious whinger" is ask you? I suppose if the arms trade had an impact in your local community you'd not be arsed either. Obviously this blogger is just another sleep walking consumer robot. Happy to tow the party line. The Borisbike scheme (in fact an idea from the sadly missed Ken) is intended to reduced traffic congestion, make cycling safer and make (apparently only north) London a more pleasant place. Why don't you plaster your anti-Barclays propaganda all over Barclays branches and advertisments instead? BTW, I'm not a Barclays shareholder or customer, before you start. The only 'tedious whinger' I've noticed is the author of this post. The stickers I saw were well done and may provoke thought in people who may not be aware of the issues. They were highlighting Barclays' position as the world's biggest investor in the arms trade. Barclays also have their fingers in a lot of dodgy pies and are notorious for their tax avoidance. Personally I find Barclays splattering their logo all over the bikes (I notice there's more Barclays logos per bike than there are TfL ones) and the naming of the new cycle lanes as "Barclays Cycle Superhighways" disgusting. If the bikes are supposed to be a public service then they should not be covered in advertising. I love how Anon 3 posts up remarked that this "gutless wimp stands us [sic] for them". Taking on tedious whingers takes quite some vim, I can assure you! A useless scheme that will have no measurable impact on modal split. 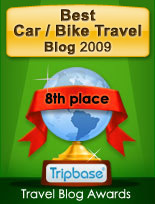 That would be impossible, with only one bike per 1600 people. The disadvantages are also well known: limited number of access points, unserviceable bikes, vandalism, failure of check-in system, relatively high cost per trip. Here is a good question for the supporters of such schemes: can you name any European city which combines high cycle usage, with such a cycle hire scheme? 'Gutless wimp', Mr Hidey-Behind-Anonymous-Post? That's the empty vessel calling the kettle black! Wow. I'm a gutless wimp, a sleepwalking consumer robot... I haven't suffered this much abuse since a taxi last overtook me. At least taxis are identifiable. Odd how well we all get on when we're talking about cycling, but as soon as it's about evil bankers it gets vitriolic. Come on guys! They would rather the taxpayer forked out £25m than Barclays? Barclays aren't the most evil corporation on the planet. They are a bank. They aren't a great bank, but they're not an awful one either. Seriously - these losers who have nothing better to do need to get a grip on the real world - and probably, a job! Without sponsorship there would be no scheme. You do not have to bank at Barclays or use a Barclaycard to activate the banks, this is not mind control. I think the stickers are quite funny, so disagree with the blogger there, but I find the "revolutionary" comments tedious and immature. Back to student politics groups with you. I too fail too see how merely riding one of these bikes makes you a lackey of the imperialist state or a running dog capitalist whatever you happen to think of Barclays. I don't really mind who sponsors the scheme but remember that Barclay's only contributed £25 million of the £140 million total, so it would have gone ahead without their input. ya reckon, BillG ? where else would that 25 million have come from? what a lot of weird comments above.... anyway in case anyone from TFL ever reads this; almost all of the bikes on Great Marlborough Street this evening were unrideable because the back brake is on too tight. @Matt Juden, I agree, 'whinger' wasn't the most felicitous choice of word as I hurried to get the post up. With a little reflection I'd have probably said something like 'tedious mischief-maker foisting their political views on everyone else with acts of minor vandalism'. 'Tedious whinger' is, though, a compact description of some of the anonymous commenters here who think that because I don't approve of someone's method of protest, I must therefore be approving of the people they're protesting against. To me, the stiff-back-wheel problem is what we should be usefully debating in these pages, not a multinational bank's corporate activities. @ the last anonymous comment, the sponsorship is spread over five years, so while the cash is welcome the scheme would have run without it. And remember that Barclays choice to sponsor the scheme taken as the scheme was nearing completion, so again it would have gone ahead anyway. BTW - Its good form to stick a name in the comment box when posting anonymously as helps other folk keep track of who wrote what. Thanks for your reply. We don't disagree very deeply, then. But we don't agree. To me it's pretty clear that 'foisting' your political views on other people is morally required if you think something is very wrong with the world and you think other people should maybe think about it. For my part, I'm not that disgusted with Barclays. It's the state's fault that the profit motive is allowed to drive the business of developing and producing arms. That private companies are allowed to produce weapons and have every incentive to invest vast sums in pro-war lobbying is also the state's fault. Someone does have to invest in arms, sadly, and in the current crazy system it might as well be Barclays. But, the stickers seem to me to be a Good Thing if they prompted any discussions like this. And how about bike maintenance on room service?